Hike along the river Lobos between walls in the amazing and not so well-known Cañón del Río Lobos Natural Park between the regions of Soria and Burgos, Spain. 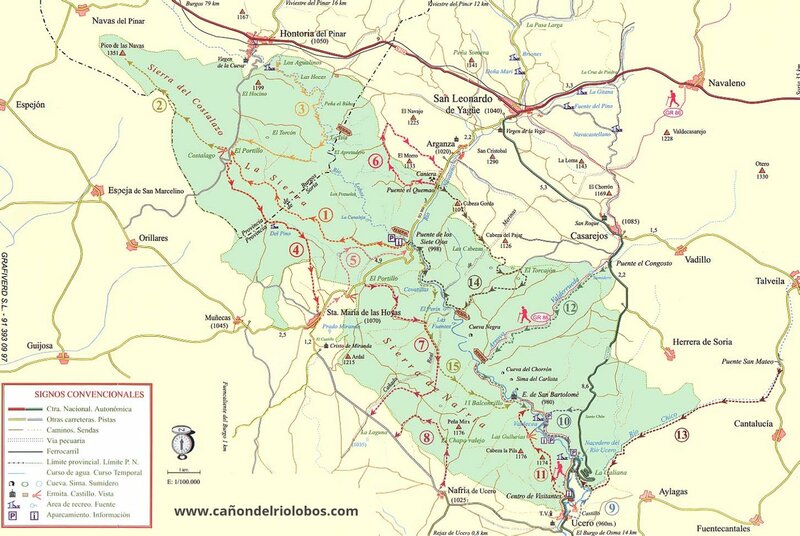 It takes about 2.5 hours to get to Cañón del Río Lobos Natural Park driving from Madrid. Along the 200 kilometers between Madrid and the Natural Park, little towns in the region of the Sierra Norte de Madrid can be spotted from the car, such as La Cabrera and its granite massif of Paleozoic origin that certainly makes the trip more enjoyable. Once in Cañón del Río Lobos Natural Park, and right after crossing the Puente de los Siete Ojos (Seven Eyes Bridge), there’s a parking area to leave the car. This is the intermediate point in the Senda del Río Lobos and is also the starting point of the route that will end in Ermita de San Bartolomé. This route runs along the canyon originated by the erosive action of the channel of the river, although in many of its sections and at certain times of the year it will not have water. The distance between the Puente de los Siete Ojos and the Ermita de San Bartolomé is 8.4 kilometers (with no real elevation gain). In about 3 hours we walked this distance while stopping several times to take pictures and enjoy the scenery along the way. Vultures, eagles, crows, herons, kingfishers or aquatic blackbirds were our companions some of them flying over our heads while we hiked. The interior of the canyon was decorated with black poplars and willows that had already turned theirs leaves into yellows and reds typical of the fall season. In the proximity of the chapel, hikers will find Colmenar de Los Frailes, an interesting apiary built in the rocks that friars used in the past. Finally, the most important historical-artistic settlement of the canyon: the Ermita de San Bartolomé, located in a privileged spot and about which there are many legends.